When I watched the first trailer for “Rango,” I was immediately captured by the stunning animation. Combine that with Johnny Depp voicing the lead role, and Gore Verbinski at the helm, and I was pretty excited to see what would happen. Unfortunately, the result is a slow-paced kids movie that feels mediocre in the end. Rango (Johnny Depp) is a chameleon who wants to be an actor, yet is stuck in a tiny aquarium. That is, until his owner decides to move – and packs him up in the back of his car for a road trip to their destination. During a bumpy car ride, Rango’s aquarium is thrown from the back of the vehicle, and he is left stranded in the desert. After meeting an wise old armadillo named Roadkill (Alfred Molina) who points him in the right direction, Rango meets another Lizard named Beans (Isla Fisher) who gives him a ride into a town called Dirt. Unfortunately for the tired and dehydrated hero, the town is going through a drought and most of the people are being forced to leave their homes. After meeting many of the locals at the saloon, Rango haphazardly becomes the town hero and is appointed Sherrif by the mayor (Ned Beatty). From there, he sets out on a mission to restore the town’s water supply. 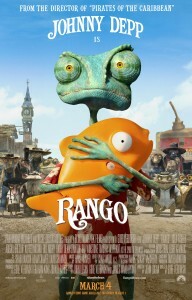 One of the big problems with “Rango” is the pacing. Given the acting talent, and the director having come fresh off the three ‘Pirates’ films, I expected that i would be going along for a fun and witty ride. Unfortunately, things move rather slow throughout the film. And to add insult to injury, laughs are pretty scarce. The concept of the film is fun, but the execution just didn’t pull through the way it should have. What makes a great kids movie is when the entire audience, comprised of children and adults, can be throughly entertained. From what I saw, it seemed that both targets were hit or miss. For kids, I have no idea how the film is going to keep their attention. Especially in the beginning, where Depp’s monologue seems to drag on forever. Don’t get me wrong – I enjoyed it. But after about five minutes, there is no way that kids are going to be able to sit there and enjoy watching a closeup of a lizard talking to the camera. As for the rest of the film, there are laughs here and there – but not enough humor to to make it worth while for adults. I think the voice talent was spot-on for the film. If there is one thing that can not be discounted, it is the creativity that was put into the story and characters. The film is basically a spaghetti western comprised of desert animals, which definitely took some imagination to create. Everyone from Johnny Depp as the lead to Bill Nighy as outlaw Rattlesnake Jake did a great job voicing the film. Ned Beatty does a great job as an animated villain, as we know from “Toy Story 3,” and is no exception as the Mayor. Timothy Olyphant even makes an appearance as “The Spirit of the West,” which is pretty funny. “Rango” is a film that looks incredible, but isn’t able to be salvaged from it’s good looks. Even with a cast of great talent voicing the picture, the pacing is just too slow for an animated feature aimed at kids – and the writing isn’t funny enough to entertain their parents. The film isn’t terrible by any means. But with the high expectations it creates by having Gore Verbinski and Industrial Light & Magic in control, it’s disappointing that it wasn’t more fun.